The concert poster is a great visual history of rock n’ roll that centers on the posters which were created to advertise the musicians and concert venues. With over six decades of concert posters available, these event posters have become a wildly popular collectible that has taken on a life of their own, sometimes outshining the rock bands they were created to promote. The popular art of concert posters allow collectors to collect by music genre, by musician, by poster artist and even by venue or promoter. Concert promoters also created handbill versions of many of their posters and used them as sidewalk handouts and dashboard fliers to promote upcoming shows. Many of these handbills were double-sided, with poster art on one side and a calendar of upcoming shows on the other. These handbills represent an important element of rock concert history because they were hands on marketing tools that united promoter and concert fan. 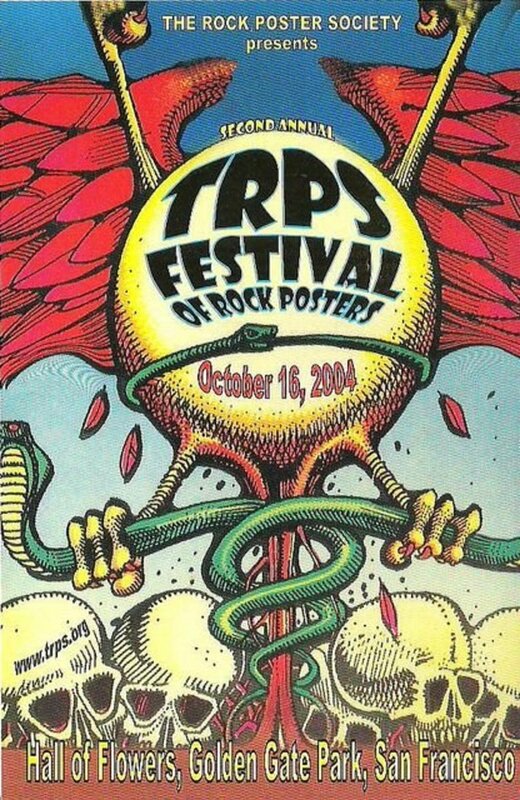 Concert poster are not only avidly collected today but have spawned collectors clubs, groups and annual conventions that celebrate the concert poster such as Flatstock or The Rock Poster Society (TRPS). 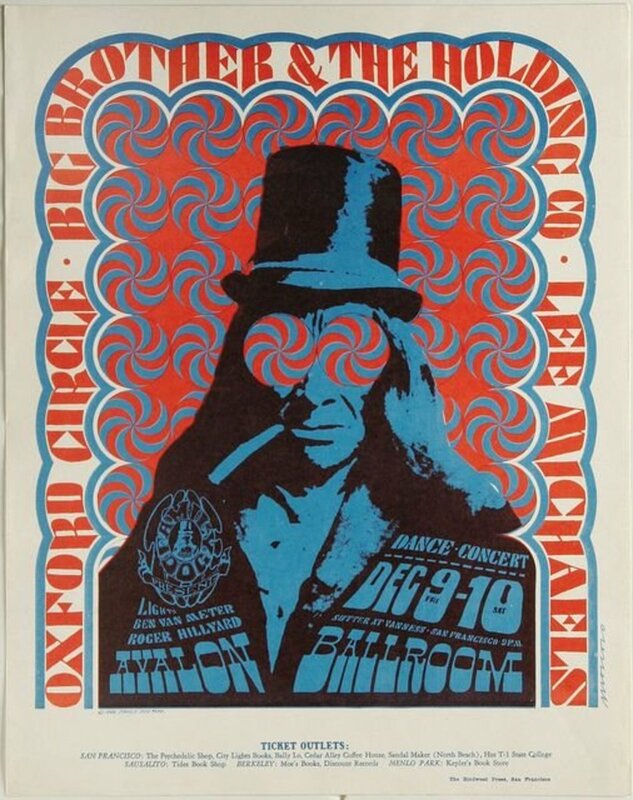 This is a fantastic pre-concert first printing of this poster starring Janis Joplin and Big Brother & the Holding Company which is from December 1966, Joining Janis and the boys on the bill that night were Oxford Circle along with keyboard wizard Lee Michaels. This poster features Chet Helm’s infamous pot-smoking top-hatted Indian mascot and future logo art of Family Dog Productions the tripped-out poster graphics and design were provided by Victor Moscoso. 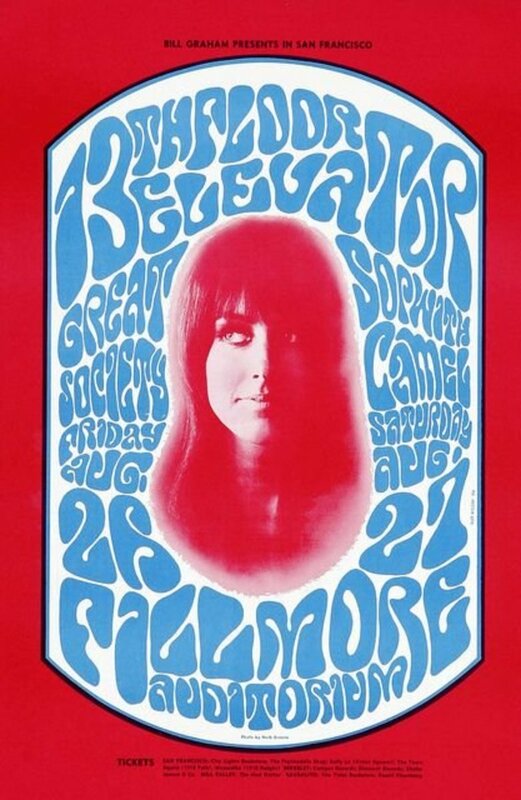 A very young Grace Slick seems to stare out from this hard to find Fillmore concert poster. At the time of this concert Grace was fronting her own band The Great Society, who had already penned the song “Someone to Love,” which would become legend when Grace again records it with Jefferson Airplane. The groups featured on this poster include 13th Floor Elevators, The Great Society, and Sopwith Camel. This concert event poster is part of the Bill Graham numbered series and is designated BG-25 with the poster graphics provided by Wes Wilson, complete with his signature lettering style that is so recognizable today in contemporary print advertising. The overall size of this great first print pre-concert poster is 13 11/16″ x 21″. Visit the The Rock Poster Society website. 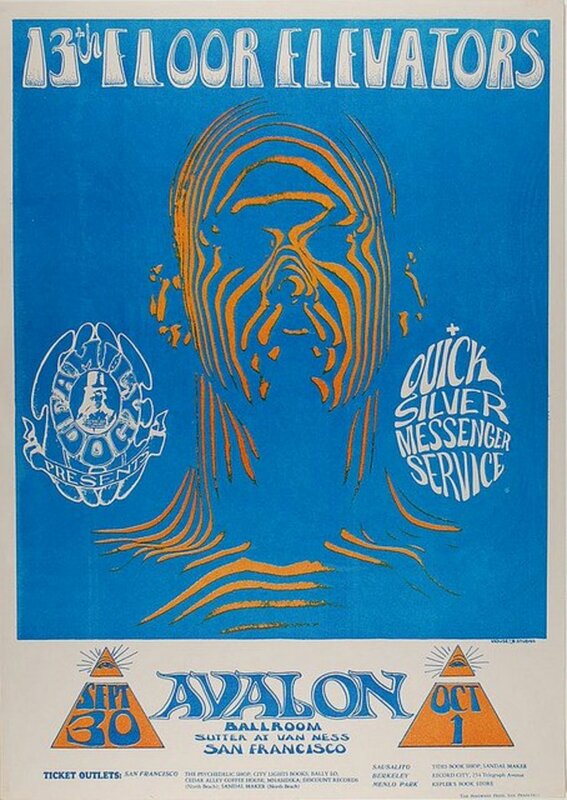 This is a great 1966 pre-concert first edition Avalon Ballroom concert poster by Family Dog Productions FD-005. This was the first Family Dog Production concert of many that were held at San Francisco’s Avalon Ballroom. The Family Dog’s logo mascot, a joint-smoking, top-hatted Indian, made his first appearance on this poster for this show featuring the Blues Project and the Great Society. These great poster graphics and design were created by Wes Wilson. Jimi Hendrix was at the height of his career in 1968, when he played these two shows for this one-day-only concert. Sly & the Family Stone, who were not mentioned on this 1st printing Fantasy Unlimited poster was the opening band and at the time were just starting to get airplay so Sly was relatively unknown and was heckled by a crowd that was there to see Hendrix. The poster graphics and design are by David Byrd’s who later designed a cover for a Hendrix press kit at Jimi’s request. This is a fantastic concert poster featuring Captain Beefheart and his Magic Band at the Avalon Ballroom Family Dog FD-13 1966. The Dada-Rock star best known at that time for his cover version of “Diddy Wah Diddy” who was the headliner for this early Family Dog show, with opening act Oxford Circle. This is a great first printing poster designed by Stanley “Mouse” Miller and Alton Kelley which measures approximately 14 3/16″ x 20″. A truly nice example of this poster is hard to find as the 1st printing posters vary in quality some are sharp and others muddy because of printing problems in the original run. The irregularities mostly consist of with the red ink which had a tendency of smearing and extending outside the black border into the lettering or the bull image, this fantastic poster exhibits none of those problems. Can You Pass the Acid Test ?? In this HubPage We Explore the Psychedelic Posters and Ephemera from Events Known As the Acid Tests Which Were Brought To You by Ken Kesey and the Merry Pranksters. In early February of 1966, the Dead followed the Merry Pranksters down to the Los Angeles area to continue and expand the “Acid Tests”. The acid test itself was conducted at the Youth Opportunities Center in Watts, CA. The Doors are top-billed for the first time on this numbered poster from the Bill Graham presents series and is designated BG-67. This is a fantastic Fillmore poster which comes complete with a crazy design by Bill Graham’s wife Bonnie MacLean which measures approximately 14″ x 23 1/16″. 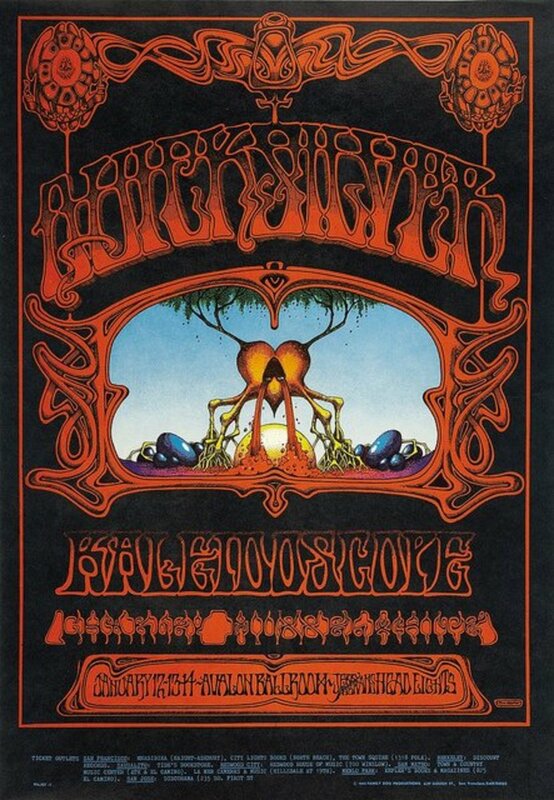 The Doors share the bill on this pre-concert first printing poster with the Jim Kweskin Jug Band and a light show by Dan Bruhns’ Fillmore Lights. “Hear the Seers in Concert” Pronounced by this 1967 Berkeley Concert Poster which featured some of the best names in mid-sixties folk music such as the headliner Dave Van Ronk, who shared the bill with Mimi Farina and Fred Neil. The posters great fortune-teller graphics and design were created by underground comix artist Greg Irons. This Greg Irons poster measures approximately 14″ x 20″. Have you ever seen a round concert poster ?? The Kaleidoscope, a fancy Los Angeles club featured round concert posters. What a great triple bill Jefferson Airplane, Canned Heat, Buffalo Springfield. on this Kaleidoscope Concert Poster.The club was housed in the former television studio which filmed the old “Queen For a Day” show, back in the 1950s This poster measures approximately 18.75″ across. In This Hub-Page We Explore the Poster Art by the Legendary Graphic Artist Stanley “Mouse” Miller Who Has Created Many Iconic Images Including the Grateful Deads’ Use & Imagery Of Skeletons and Roses. Palaghiaccio Marino Rome Italy concert from the ill-fated last tour would be one of the band’s last shows. The poster features a haunting, In Utero-inspired design by Italian artist Alessandro Locchi which measures approximately 19.5″ x 27.75″. This is a Limited Edition Nirvana poster of 1000 pieces. This is a great psychedelic Family Dog concert poster for The Doors at the Avalon Ballroom Concert Poster FD-57 1967.. Any fan of 1960s Psychedelic art has to love this Doors poster which was designed by Zap Comix artist Victor Moscoso for the legendary Avalon Ballroom, it’s as trippy as they get! This first printing poster measures 13 15/16″ x 20″. Throughout their career, the Grateful Dead frequently performed at benefits for a wide variety of causes including the Rex Foundation founded by the Grateful Dead. When the Dead got busted in New Orleans on drug possession charges, several San Francisco acts felt compelled to play a benefit for them. This is the Bill Graham series poster from that special event, a note of interest — this is the only poster in the Bill Grahams series that does not read “Bill Graham Presents” at the top, but instead, it reads “A Benefit For The Grateful Dead.” Bands performing at the benefit were Quicksilver Messenger Service, Santana, It’s A Beautiful Day, and Dan Hicks and his Hot Licks. Light show by Glenn McKay’s Head Lights. The great design and graphics on this poster by Randy Tuten with the overall size of this poster being 13 7/8″ x 20 15/16″. This is a fantastic Bill Graham presents Grateful Dead Fillmore West concert poster with the designation BG-144 from 1968 which measures 14 1/16″ x 20 3/8″. On this evening the Dead shared the stage with Quicksilver Messenger Service and Linn County. The psychedelic art and design on this Fillmore poster are by Lee Conklin. This is a Great Black and White Poster for the Grateful Dead and Blue Cheer measuring 15″ x 22.5″ printed on off-white textured stock. The poster art and design is by Rick Griffin who has been closely identified with the Grateful Dead over the years and this image is a macabre variation on the Dead’s lightning logo. This 2nd printing poster was printed by Rick Griffin in collaboration with Psychedelic Solution in the 1980s. It was printed on four different paper colors: white, blue, red, and purple. It is slightly larger than the original, measuring 15″ x 22 3/4″. Randy Tuten designed this stylish 1969 Winterland poster of the Folk Rock foursome Crosby, Stills, Nash, and Young. This concert poster was part of the Bill Graham numbered series designated as BG-200. 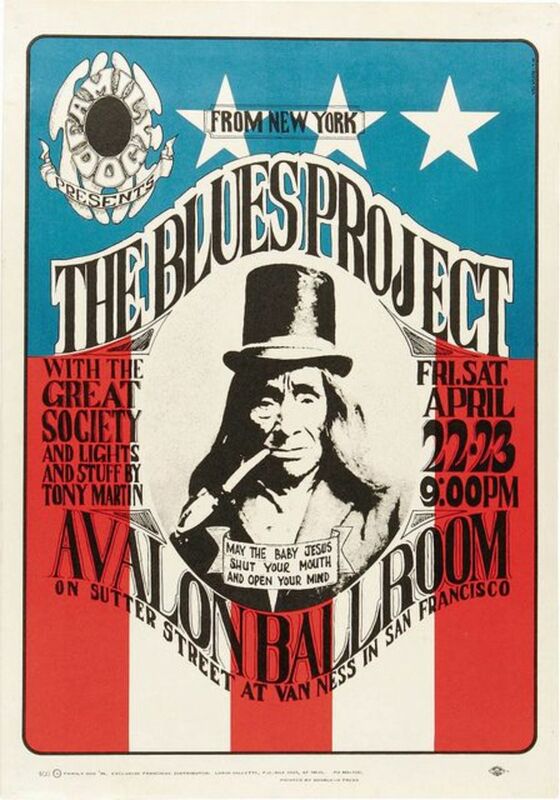 This concert poster only had single printing which was a milestone for Bill Graham as it was his 200th concert. Joining CSN&Y at these shows were Cold Blood, Joy of Cooking, and Lamb. This concert poster measures 14″ x 21 7/16″. This is one of the first Fillmore posters to utilize the soon-to-be-standard psychedelic lettering style invented by artist Wes Wilson. 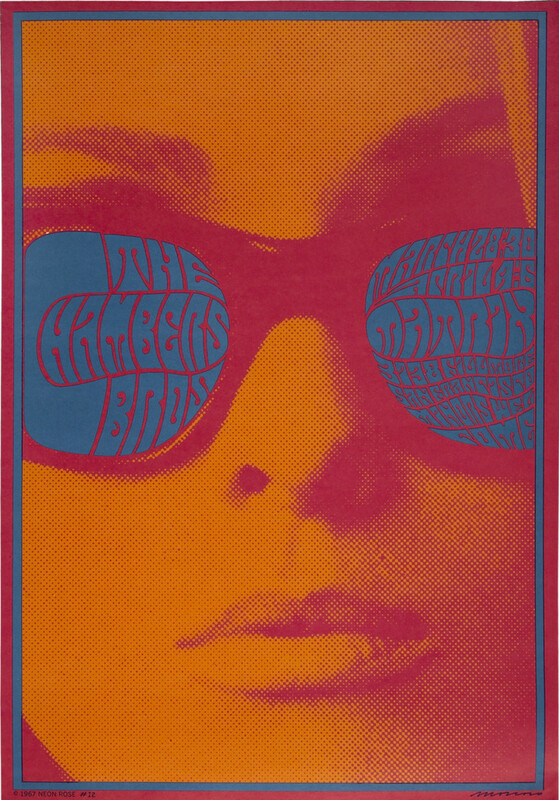 This is an early Bill Graham numbered series poster designated BG-04. Jefferson Airplane share this bill with Quicksilver Messanger Service and Lightning Hopkins on this pre-concert 1st printing poster which has green and purple ink printed on a plain un-coated white stock that measures 14″ x 20 1/16″. In This Hub We Explore the Record Store Promotional Poster, An Advertising Posters Sent Out by Record Labels To Promote Their Bands Latest Release or the Release of a New Movie Soundtrack. This Hub-Page “Collecting Movie Posters” explores the many sizes and shapes of movie posters from around the world which also includes a great photo log of vintage movie posters. I make no copyright claims on the video content or images of drawings, paintings, prints, or other two-dimensional works of art contained with-in this article, the copyright for these items are most likely owned by either the artist who produced the image, or the person who commissioned the work and or their heirs. Under Section 107 of the Copyright Act 1976, allowance is made for “fair use” for purposes such as criticism, comment, news reporting, teaching, scholarship, and research. Fair use is a use permitted by copyright statute that might otherwise be infringing. This entry was posted on 2 August, 2017 in homepage. Bookmark the permalink.